The Municipal Measurement Program (MMP) launched in January 2019 with the goal of harmonizing the measurement of material management programs and providing municipalities with decision-making tools that can improve recycling program performance. This free Program Assessment and Planning Tool provides participating municipalities with access to powerful analytical reports designed to measure waste diversion performance and improve programs. Municipalities face a variety of challenges when it comes to reducing the amount of waste their communities produce. Program managers rarely have enough time or money to properly measure the progress they are making toward achieving their diversion goals. Tracking important performance metrics and researching program improvement options can also be challenging. Without efficient access to reliable program performance reports, municipal staff can struggle to identify the best course of action to improve recycling. Watch the video to discover how the MMP will help municipalities to overcome these challenges and improve their waste & recycling programs. We received a lot of great questions during the webinar but ran out of time before we could answer them all. Below you will find the answers to your questions. Please note that we attempted to consolidate and simplify questions to be valuable to everyone. I already have a Re-TRAC Connect account; do I need to create a new account to participate in the MMP? One of the benefits of hosting the MMP in Re-TRAC Connect is that municipalities can use their existing accounts to access the MMP. However, to ensure you are the correct point of contact for your municipal agency, we kindly ask that all municipalities begin by applying to join the MMP. Once your application is approved, the MMP team will ensure the MMP is added to your existing Re-TRAC Connect account. Our program is very robust; can we have more than one user added to our account to help submit data to the MMP? 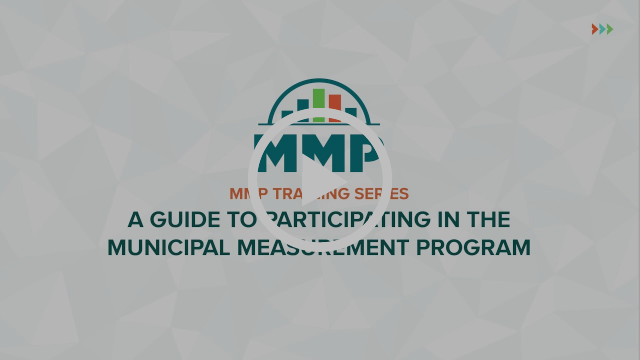 Only one account can be created per municipality so the person who applies to participate in the MMP will be the same person who must complete the program assessment surveys. If information needs to be gathered from multiple departments, consider organizing a working team to assemble the information you’ll need to participate in the MMP. How does the MMP compare with other data collection resources in various states? And have you coordinated with relevant state agencies? There are a variety of municipal data collection programs in place at the state and county level throughout the US and Canada. One of our goals for the MMP is to provide these agencies with the option of using standardized surveys (the MMP) to collect information about municipal programs in their jurisdiction (while still allowing for additional data points to be collected as long as the core set of MMP fields are captured). Several state agencies have provided feedback on the MMP, and we will be continuing to connect with state government agencies to discuss how the MMP can support their current activities. Does the MMP collect any information about HHW collection, commercial collection, or financial data? The MMP team plans to expand and refine the types of data that are collected via the program assessment forms. This may include adding an Institutional, Commercial, and Industrial (ICI) survey, expanding the organics collection section, introducing a financial section, and more. Please let us know which data points are most important to you, by emailing mmp@re-trac.com. Does the MMP collect data about waste management providers, franchise agreement start and end dates, or programs that have source separation vs single-stream? The current version of the MMP does not collect data about contracts or service providers but these are modules that are being considered for the future. The program assessment surveys do capture program characteristics such as single stream vs. source separation. Can I enter historical data to view diversion trends? At present, the MMP only collects 2018 program data. The MMP team plans to introduce trend reports when the 2019 program assessment surveys are released in January 2020. For 2019, our goal is to create a large-scale national database of municipal program information so that in future years, we'll be able to provide participating municipalities with region-specific benchmarking reports. The MMP only collects annual data, but is there a way to monitor monthly trends? The MMP currently collects tonnage data for an aggregated 12-month period. While we will consider options to collect the data more frequently in the future, our beta testing phase demonstrated that annual data was the most common data set available. Can I compare our municipality's performance to other municipalities in other regions? Region-specific benchmarking reports are not available at this time. As mentioned above, this year's goal is to create a national database of municipal program information so that in future years, municipalities will be able to benchmark themselves against aggregated data from other communities that share similar characteristics. How does the MMP ensure that benchmarking reports provide equitable comparisons given that municipalities will always have differences in programs, definitions, etc.? Municipalities have access to the "Single-Family Lbs/Household Recycled Compared to U.S. National Average" report. Over time, our plan is to expand the ability of municipalities to benchmark themselves against aggregated data from other communities that have similar program and community characteristics. For example, the MMP will allow a less populated municipality using bins on a biweekly collection schedule to compare their per household recycling numbers to averages or medians from the subset of other municipalities participating in the MMP of similar populations that also collect material from residents using bins on a biweekly collection schedule. How can I get tonnage information from my current hauler? If you don't have access to diversion data (e.g. tonnage that has been recycled) there are a few options to obtain it. The first option would be to consult with your hauler(s) and request this information from them on a predetermined frequency (e.g. monthly, quarterly, annually). Alternatively, if your municipality owns the landfill, material recovery facility, or transfer station in your jurisdiction, you may be able to get access to the data from the end destination. It is important to be careful not to "double-count" weights, so if you are able to get data from both the haulers AND the end destinations, you'll want to compare the data sets for accuracy, not combine them. For municipalities that don't have an established data collection system, the MMP's Program Recommendations Report will introduce them to helpful tools & resources developed by The Recycling Partnership. Does the MMP collect information about bottle bills? Is there any way to normalize the measurement of drop-off performance for bottle bill and non-bottle bill communities? No, the MMP does not currently collect data about bottle bills. Bottle bill specific information will be considered when we expand the MMP surveys for the 2019 reporting year. How does the MMP account for material that is collected via curbside programs but doesn't actually get recycled, such as contamination? Both the Residential Curbside Program Assessment Survey and the Residential Drop-Off Program Assessment Survey collect information about the annual contamination rate of recyclables collected via the curbside recycling and drop-off programs. Municipalities have the option to provide the average annual contamination rate, an estimated range, or decline to provide a contamination rate. Does the system consider waste-to-energy (WTE) as diversion? At present, the MMP only collects tonnage information for recycling, MSW, and organics curbside and drop-off collection programs. The program assessment surveys don't collect information about how collected materials are processed but we ask that municipalities avoid including waste-to-energy (WTE) in their annual recycling tonnage number. Does the MMP count Construction & Demolition (C&D) and Alternative Daily Cover (ADC) as diversion? The MMP isn't collecting information about C&D programs yet. It collects tonnage information for single-family & multi-family recycling, MSW, and organics curbside and drop-off collection programs. See diversion rate report formulas above. 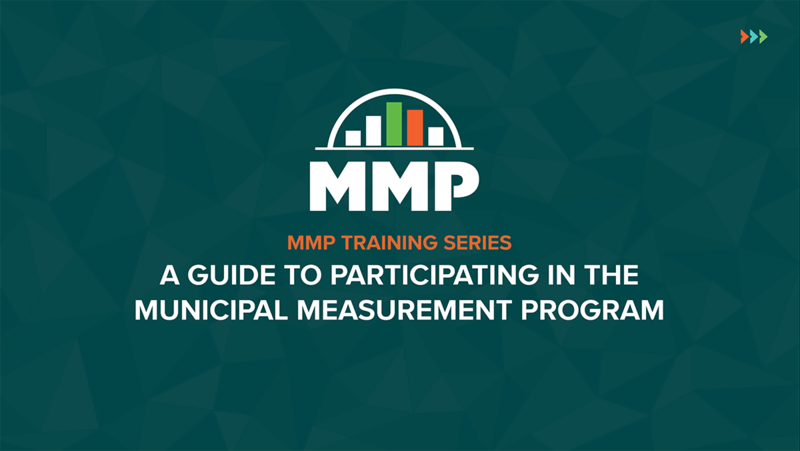 We developed a following guide to help municipalities participate in the MMP. Watch the training video for a step-by-step guide to completing the MMP's program assessment surveys. While this webinar will focus on municipal participation, if you represent a state, county, or other regional government agency, you will soon be able to purchase access to information about municipal programs within your jurisdiction. I wasn’t aware of yesterday’s webinar but would have liked to join. Will the replay be posted online? Yes, we will make it available very soon!